Before I met Steve, I was in a relationship with a man that defined my life (and not in a good way). My life during this period revolved around said man. All of my free time was spent on him. And I spent six years with him. I voluntarily gave up 2,190 days to benefit someone else. I had no hobbies because everything centered around him. After extricating myself from the sickness and dependence of that nightmare, I realized part of the recovery would be to get involved with something outside of work that could occupy my time. It was hard for me to figure out what I should do; I've always been a reader but reading did not give a sense of accomplishment or encourage my creativity. I met Steve and was very impressed with his artistry in painting. I could see Steve's personality in his paintings - devotion, straightforwardness, and positivity. I envied his ability to create something. At the time, I had no tangible evidence of my creativity. Pointing to a pile of books and saying "I read these" is not my idea of great accomplishments. Steve tried to help me figure out what I could do but his suggestions were basically things that we could do together. I really needed something to do for myself. And that's how I discovered knitting. Teaching myself knitting has given me confidence to try other things. I'm also learning how to speak conversational Spanish (I bought a collection of CDs called the Pimsleur Method). I have to say that my redneck hillbilly accent is not evident until I speak Spanish, and then it is overbearing! There is no doubt I'm from Polk County, Florida when I say MOO-CHAS GRA-SEE-AS. Thank you to whatever force or entity or karma or fate bought me to this place in my life. I appreciate getting to know myself again. I feel remarkably calm. Of course, I take this as a sign that all hell is going to break loose. I live my life constantly waiting for the other shoe to drop. But somehow, this does not paralyze me; instead, I see moving on with my life, such as it is, as a challenge. And it turns out that I like challenges. Yesterday I attended a "Learn to Crochet" class at a local yarn store, Sip & Knit. The class was only $30 and I received two plus hours of instruction (there were only two students in the class, including me, so I basically received one-on-one instruction). I was totally confused for the first hour and thirty minutes; I felt like I was struggling to get my mind around it and that I was just mimicking what the instructor was showing me. I didn't know the how or why behind it. I fumbled around and managed to create a simple crochet border on a knitted swatch. It was not impressive but I had fun in the class and signed up for another one on the spot (Learn to Knit Continental). I was intrigued and after I got home, I pulled up as many beginner crochet videos as I could and started practicing stitches. 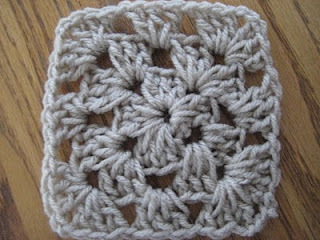 I was a bit bored with it until I found granny squares. My super secret project is over. And no longer super secret. Why? Because the project is so ugly. I am very disappointed in all aspects of this project. The colors, while looking gorgeous wrapped up in skein, did not go well together. On top of that mistake, the pattern I chose highlights the colors in all the wrong ways. This project was intended to be a gift but now has forever home with me and the cats. Then, a miracle happened. Or maybe it is just the natural outcome of spending so much time with the project. Like a mother who births a less-than-adorable baby, I started to love this ugly project. The colors are not well represented in this picture but even if they were it would not make this any better. 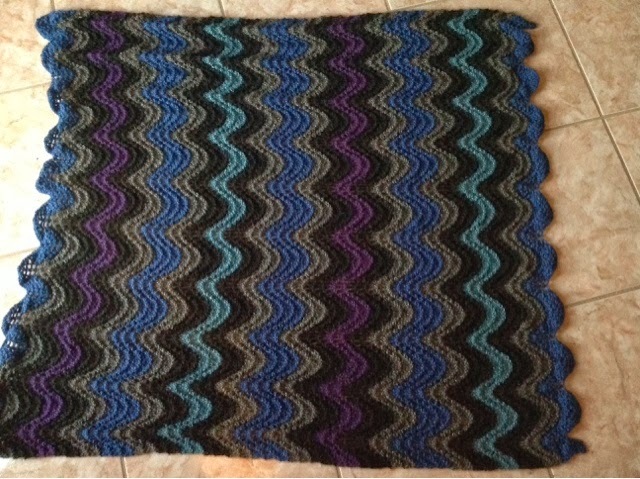 I have analyzed my choices and believe that this particular ripple pattern is appropriate with three colors or less.